Share your experiences with KUV100 NXT? 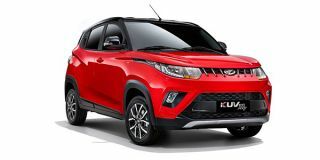 To ensure that the KUV100 NXT lasts longer than the original recipe, in other words more than 21 months, Mahindra has given its most affordable offering a more mature makeover. At the front, the redesigned bumper is accompanied by a bigger, sportier skid plate, the grille gets sharper chrome slats and is flanked by dual-barrel headlamps. The sides profile receives more prominent plastic cladding and the roof rails get their own subtle tweaks in styling. The alloy wheels have been to the beauty salon too and now flaunt a new look. The character lines at the sides and the rear of the hatch have been toned down a bit as well. Even the rear styling has been changed with a restyled bumper, which incorporates a faux silver skid plate, and clear-lens tail lamps with different internal graphics. Simply put, no matter how hard you try, you won’t be able to second Mahindra’s take on it being a ‘compact SUV’. The cabin was always on the practical side for living and nonliving things. To match the competition though, Mahindra has equipped the KUV100 NXT with a 7.0-inch touchscreen infotainment system which boasts built-in navigation and has the support for the company’s Bluesense and Intellipark technologies. The added convenience of follow-me-home and lead-me-to-vehicle headlamps come in handy too. On the dash, the old-school controls for the AC have been replaced by an electronic temperature control panel. With the facelift, the KUV100 NXT also gained Mahindra’s voice alert system and a gear shift indicator in the instrument cluster. The interior upholstery, including the seat covers, is all black for a sporty vibe. ABS comes as standard on all variants, whereas dual airbags are missing on the base K2 variant. The real downer is the absence of Android Auto and Apple CarPlay, which most of its direct rivals have on offer. Confused about Mahindra KUV100 NXT?